2 cocoons look ready to eclose in a few days. That large larvae cocooned last night, and it create a bright brown cocoon. Much like the others, but that white cocoon remains white. 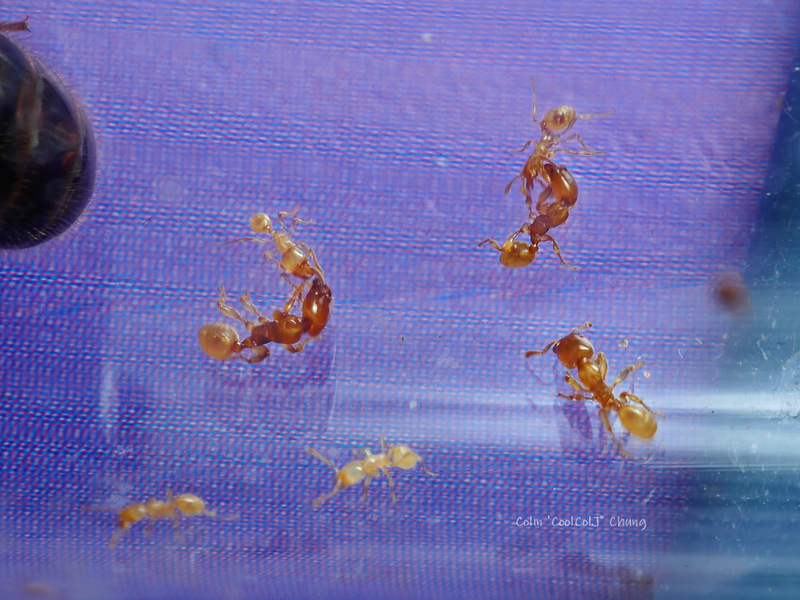 Setup 1, Queen 3 and 5 continue to get more workers. 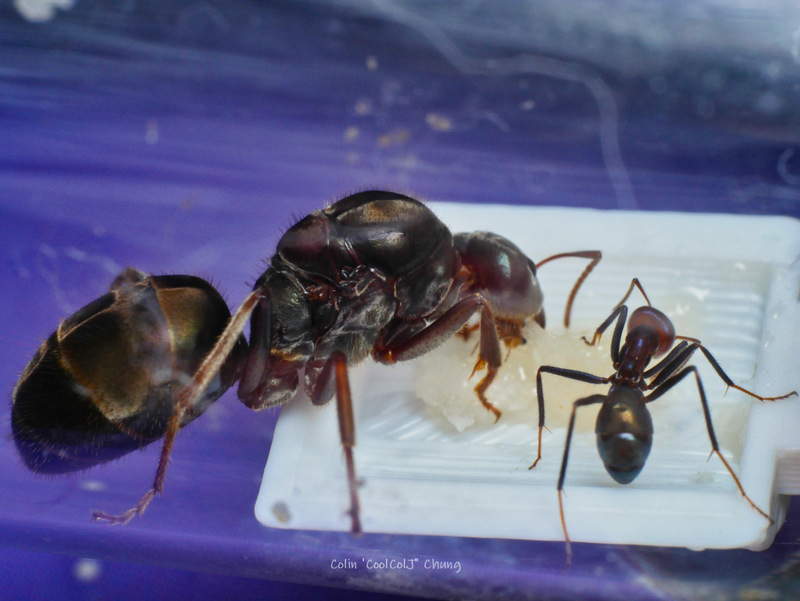 Queen 4 got another nanitic from her donated pupa. Queen 6 has her first 2 nanitics. She has just as good genes as queen 3 and 5 by the looks of it. 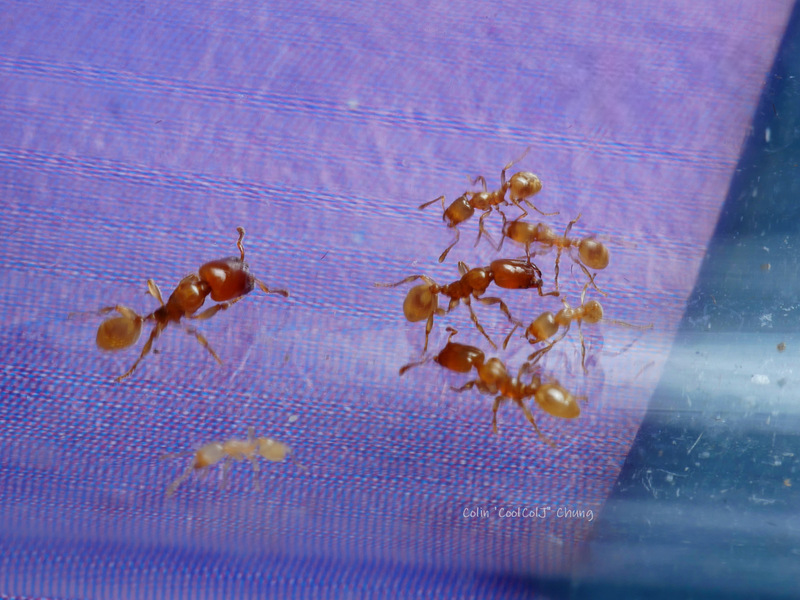 She laid a week after queen 5, when I separated them, and now a week later than queen 5, has her own workers with similar starting brood size. I think i will donate some brood to her, as she was separated from setup 2, so probably running low on reserves. 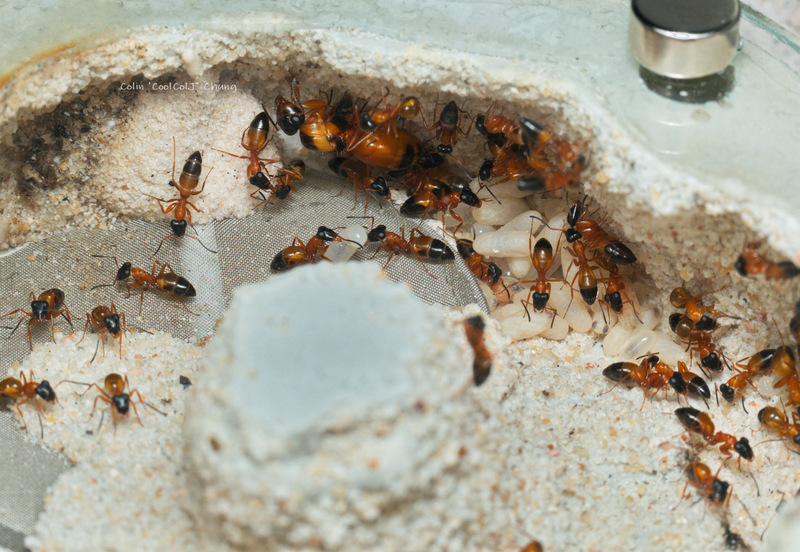 Queen 3's nanitic mini majors have matured and now no longer tend the brood, and I see them sit in a group in the front part of the chamber. Edited by CoolColJ, January 29 2019 - 3:41 AM. Large larvae may cocoon this week. All the small larvae have grown a lot, closer to medium sized now. So the next batch will have 8-10 cocoons all spinning around the same time. 1 Major, 3 minor workers - 1 cocoon, 1 small larvae, 6+ eggs? RIP Ahh dammit, the queen is dead!!!! I saw a black round thing last night and thought it was a piece of cricket I fed them. 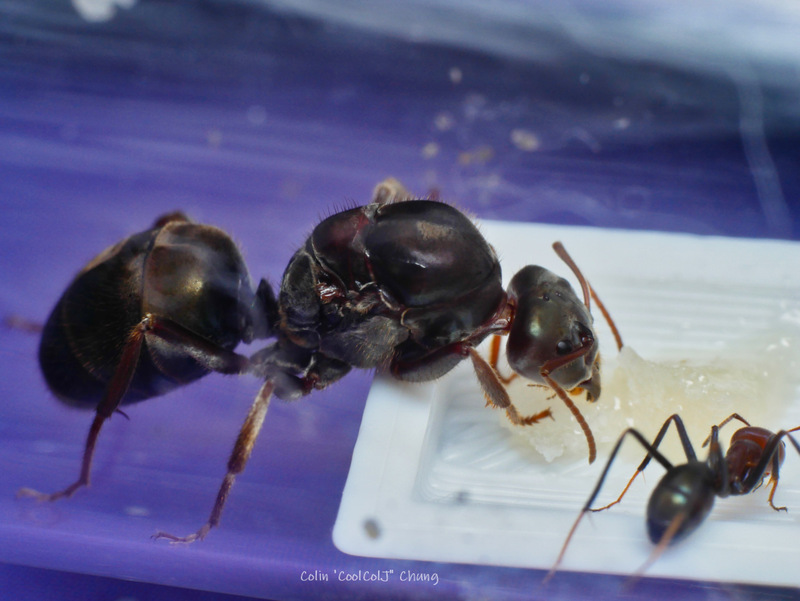 On that note I am looking to replace them with the large species queen, like the one I had previously that died. A few people have found some queens. Edited by CoolColJ, January 30 2019 - 3:25 AM. Long story, short, I originally bought this queen, and her eggs never hatched in 2 months despite being on the heat cable. I sent her back and exchanged for another queen, which I eventually sold - I was never in love with this one. 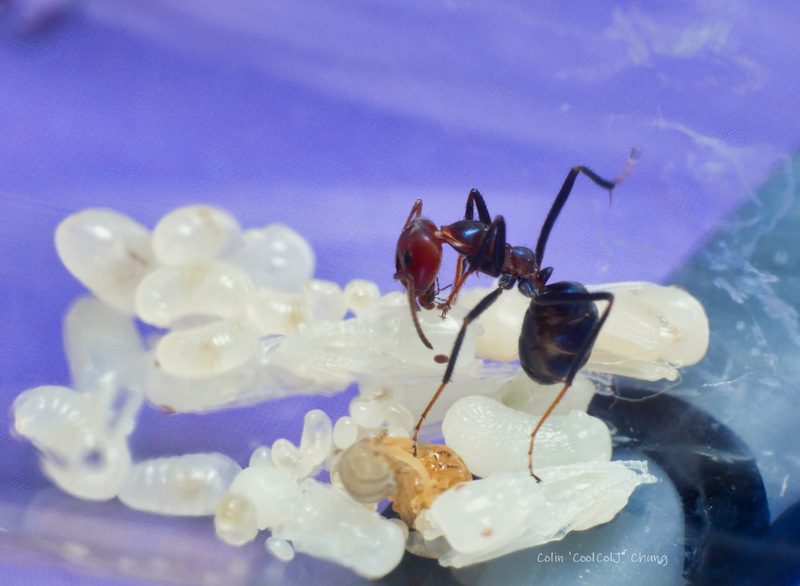 Meanwhile my other one did get larvae and now has a worker. The seller offered her back to me free, just pay for the postage! The girl that found my antipodum queens might be able to get some Melophorus bagoti. These are a pretty big species of Melophorus as well, and pretty rare. Australia’s desert ant (Melophorus bagoti) has several claims to fame: Australia’s most heat-loving animal, superb navigational skills using three different systems, and one of the fastest ants in the world. Its navigational skills are proof that small brains can do sophisticated things. Edited by CoolColJ, January 29 2019 - 7:35 PM. 6 workers, 2 large larvae, brood? Edited by CoolColJ, January 29 2019 - 8:17 PM. Woah, I can't wait till the development of the Colobopsis macrocephala. She looks so beautiful. I'm not going to search her on Google, just to let my excitement and my phantasy play xd. And ow. I hope u will find a new Anonychomyrma gyne! Keep up the amazing updates. We really love this journal! 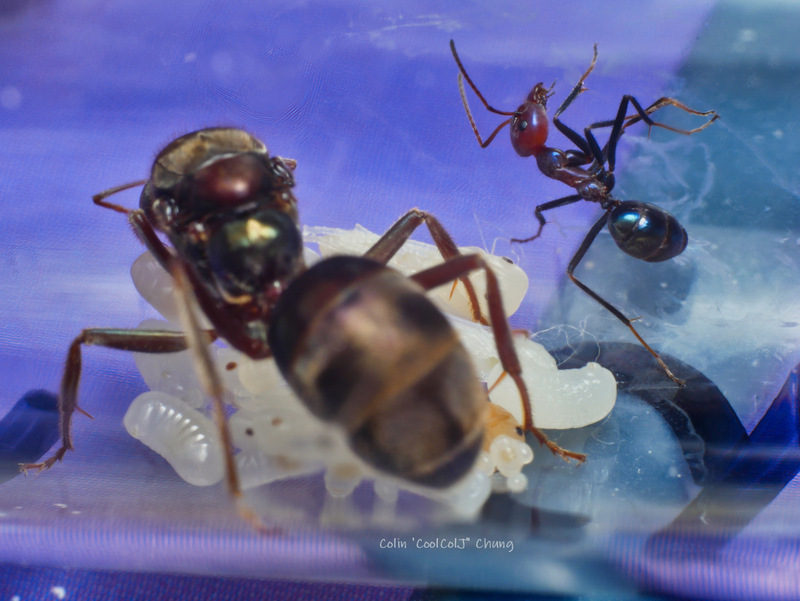 My first meat ant queen arrived today and finally has her first nanitic. If you look at the other pics of the other queen/colony I had before, I'm sure you can see the differences in appearance. Much lighter and more iridescent, and those puppy dog eyes. I don't blame her, this one was caught last season, so this is the first time she has eaten in over a year! They also follow the heat cable where ever you place it, so it won't be hard to move them into a new test tube, which I need to do, as this one is almost out of water. Edited by CoolColJ, January 31 2019 - 2:02 AM. Will move them into my incubator for now. next nanitic should eclose in a 1-2 days time. Dual queen setup 1 has around 8+ nanitics now, I moved them out of the incubator and put them outside on the heatcable. Need to keep an eye on them, in case the workers decide to take out a queen or banish one. I donated some brood from queen 5 to dual queen setup 1, and queen 7. 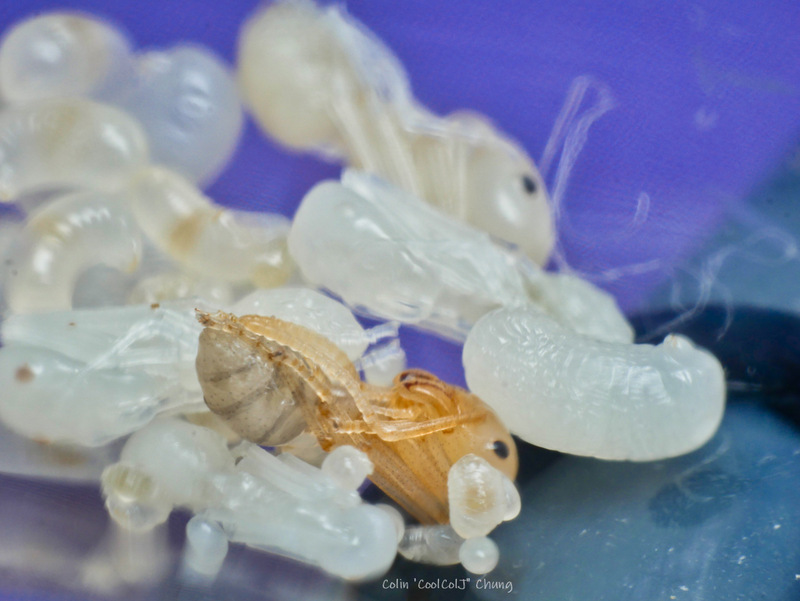 A few eggs, larvae and pupa. 1-2 yellow pupa and a mini major pupa for setup 1. 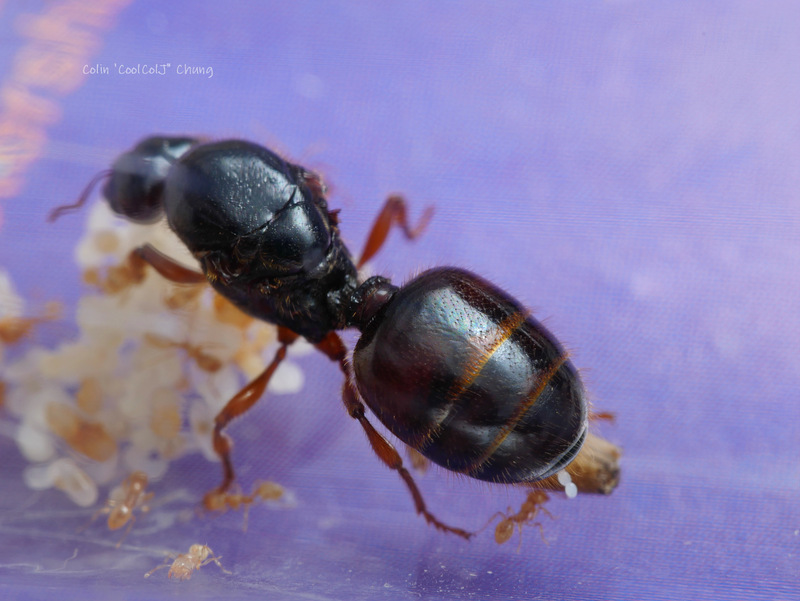 And the same for queen7, but more eggs and a few larvae, but no mini major pupa. That will help them out a bit, and queen 5 still has tons of brood. I used my smallest and straightest bristle paint brush to stick the brood on and then hovered over the queens and tapped the brush to unload the brood. 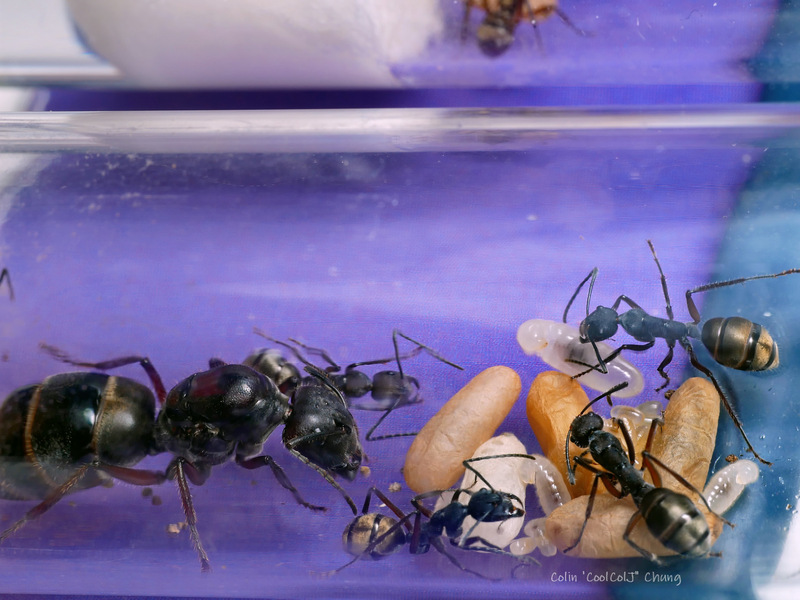 Dual queens gathered the brood up. I have a feeling it's from the cardboard I used in their test tube. 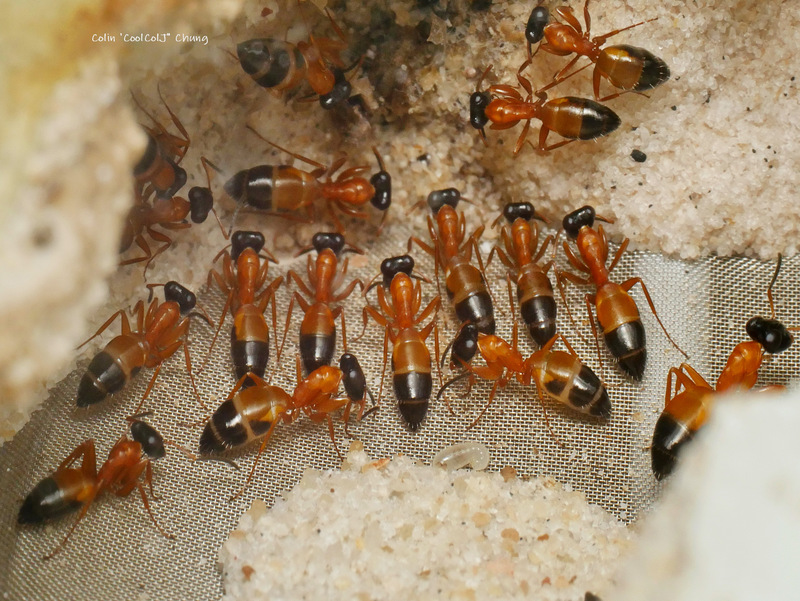 Saw the same thing in my past Rhytidoponera aspera gamergate colony that used the same cardboard! 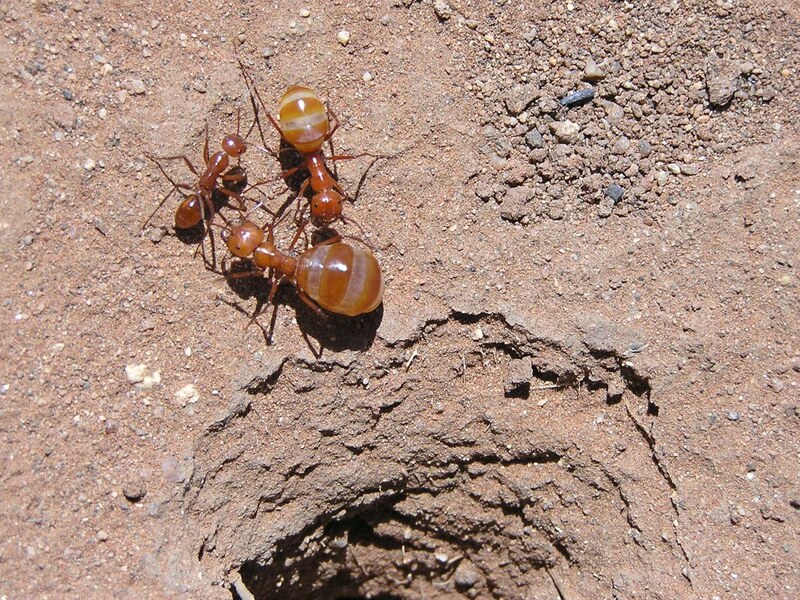 Shouldn't be an issue for the ants with the small workers being able to take out these critters. Edited by CoolColJ, February 2 2019 - 8:58 PM. Aye crumba, another cocoon eclosed! 12 workers now, and 4 large larvae. One should be cocooning soon. Edited by CoolColJ, February 1 2019 - 1:37 AM. funny seeing the first worker pile all the pupa right against the exit cotton wedged under the feeding dish inside the test tube. These girls are up to around 60 workers now. And it looks like 2 more cocoons about to eclose soon. Growth speed has just increased a lot! Edited by CoolColJ, February 2 2019 - 4:15 AM. You have very well keeping your strobe ants. They look healthy. Good job! 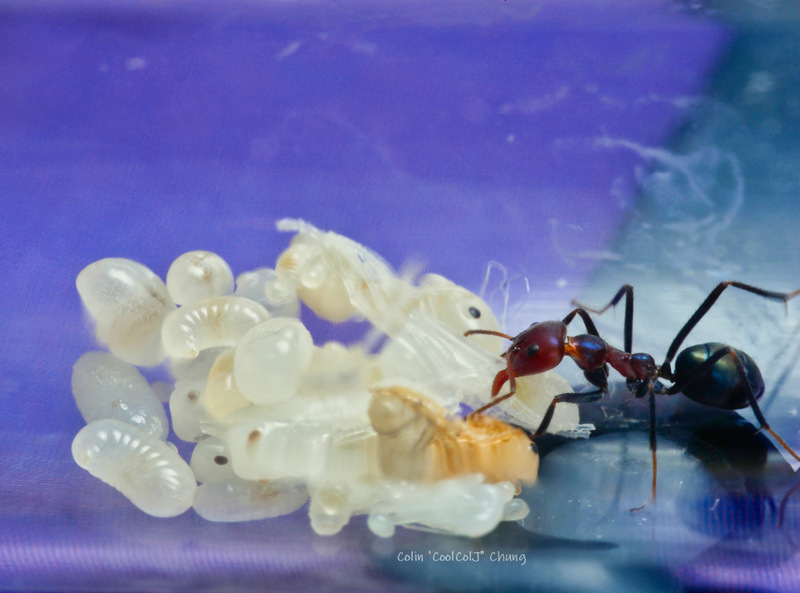 Do you feed your ants anything else beside raw honey? SUNBURST ant nectar is out. Not sure how much shipping costs, but you could try that. But a jar of mountain bee raw honey has a really strong taste and smell that the ants love, that doesn't cost too much and the jar is barely down to 90% after a year. Plus I can leave the honey in the dish for a few weeks and months and it won't go off. And there is honey comb in the jar which is solid so better suited to small ants, to prevent drowning. 2 nanitics eclosed this week. The 4th one today, which is from her own brood. The first 3 are from donated brood. Large cocoon spun a cocoon last night. 5 large cocoons now.. larvae grows so fast! 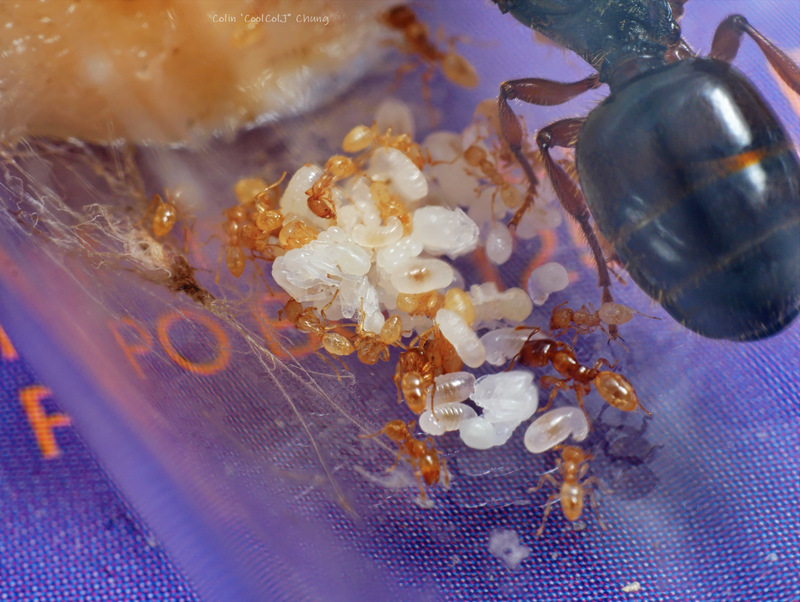 queen 6 - at 5 nanitics now, fed them. Will start to sell some of these setups this week. Edited by CoolColJ, February 3 2019 - 11:36 PM.